Recently accepted to graduate school, Cyrus Allen plans to become a counselor to help people with gender and sexual issues. Full Name: Charles Jeffery "Cyrus" Allen Jr.
Family: "Martha and Jerry Birdwell, my grandparents, without whom I would have never gotten to where I am now. The two of them have been loving and supporting to me in excess of my own biological parents, and have imbued in me since my childhood a sense of caring and kindness that is core to who I am today." Current Employment: Library Student Assistant on the Macon Campus. 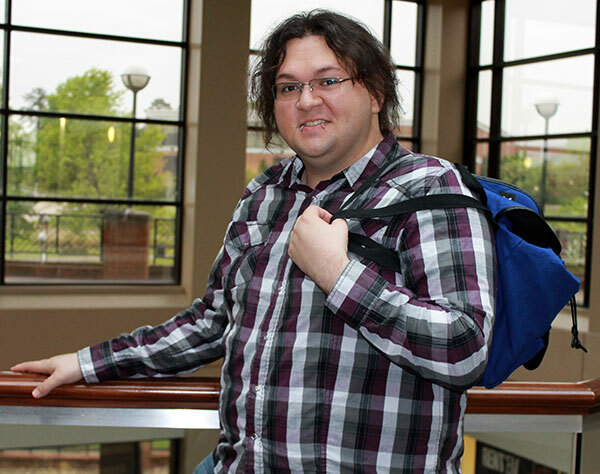 University, where he has been accepted into the Master of Science program in Clinical/Counseling. Career Goals: "I'd like to become a Gender and Sexual Issues Counselor. As an openly homosexual male in the South, I've seen firsthand the kind of cruelty and lack of empathy humans can have towards those with an alternative gender or sexual identity. Our history in recent years is one of 'one step forward, two steps back' in terms of LGBTQA+ rights and attitudes. It is critical that I apply my experiences and passion to advocate for, counsel and educate teens and adults who struggle with their own identities, as well as provide a degree of support for them in their communities." much, much more than just a student walking the same shared space as tens of thousands of others. This University is personable, and I am deeply grateful for my time here." before and it was, without a doubt, the most important experience of my life to date." The one person he'd most like to meet is ... "Frederick Francois Chopin, the late master composure and pianist. He was a man who lived a life of pain and adversity, including a chronic health condition, yet he used his pain and passion to compose music so breathtakingly beautiful and simple that it displays a mastery of emotion and subtlety I've never heard the likes of anywhere else." In five years ... "I hope to be working in the Atlanta or Macon area as a counselor and advocate for LGBTQA+ individuals! I want to turn my own experiences and passion into the means to help others and provide a service to the community and to my fellow LGBTQA+ community members who struggle in the admittedly tumultuous social and political environment."